ESCAPE GAMES HAVE ARRIVED ON HILTON HEAD ISLAND, SC! All players must fill out a waiver before playing Escape Games. To save time, you can fill out your waiver prior to arriving. If you prefer to fill out your waiver in person, please arrive 15 minutes early to complete your paperwork before your game starts. Please be aware that all game rooms are dimly lit. If you’re under 18 and coming without a parent or guardian please fill out a waiver prior to arriving. If you’re under 14 years of age, you must be accompanied by a parent or guardian. If you prefer to fill out your waiver in person, please arrive 15 minutes early to complete your paperwork before your game starts. We are proud to offer a $5/game Military discount to all active and retired Military members. Please present a valid Military ID upon checking in. Remember, you may be grouped with other players unless your group takes up all 12 spots in the escape room. You have accepted the challenge from the Great Harry Houdini. 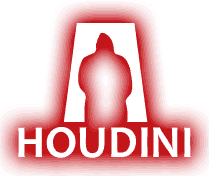 Prove your skills by overcoming the locks, puzzles, and codes created by the Great Houdini himself. Escape and you will earn membership into a secret society that includes the greatest magicians in the world! You and some friends are super excited about a long anticipated weekend hiking trip in the Great Smoky Mountains National Park. After stopping at the last supply/rest area, your group is mysteriously taken captive, blindfolded and led to a very remote abandoned cabin several miles up the mountain. Step back into 19th-Century Victorian London and assist the genius detective Sherlock Holmes and Scotland Yard apprehend Professor James Moriarty, a criminal mastermind who has unceasingly terrorized the good citizens of London.